SEOUL, Oct. 11 (Yonhap) -- South Korea's top portal operator, Naver Corp., on Thursday announced a business blueprint that moves beyond its existing online and network business and focuses on technology that is linked to the living environment. 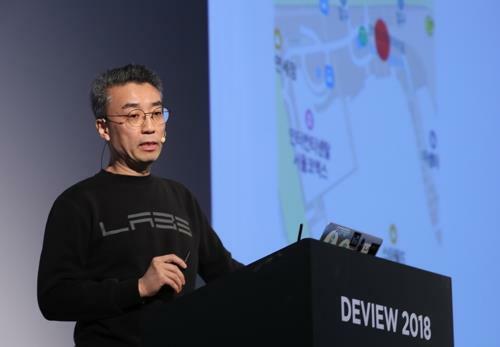 "The key technological strategy that Naver is pushing is living environment intelligence," Song Chang-hyun, the company chief technology officer (CTO), said during an annual IT conference, DEVIEW 2018, in Seoul. He also serves as the head of Naver Labs, the research and development arm of the company. The CTO stressed the importance of solving the problem of physical movement with technology, utilizing maps, for instance. The company plans to unveil the "Naver Map Enterprise API" next month, which will let users embed Naver Maps in their own websites, Naver said. An application programming interface (API) allows users to communicate and integrate with services while allowing developers to expand the functionality of the service. In addition, Naver plans to roll out "xDM Platform," a location and mobility intelligence platform developed by Naver Labs. "Naver will continue to work closely with various operators to make the largest location mobile platform in South Korea that can be used more effectively in real life," Song said. Various location or movement technologies currently under development, such as 3D head-up displays (HUD) and high-quality maps for self-driving cars, were also unveiled during the event. Naver said it plans to participate in next year's the Consumer Electronics Show (CES) in Las Vegas to showcase its latest technologies.